If there is one thing that makes spring more alive, it’s the presence of blooming flowers everywhere. Wouldn’t it be just divine if you can display all the beautiful blooming flowers as a wreath in your home? To do this, prepare scissors, hot glue, a few bouquets of your favorite flowers, and a wreath base that is preferably made of twigs. First, separate the stems and remove the leaves. Next, begin inserting the stems between the twigs and secure them in place using hot glue. Do this until the entire base is covered with flowers. Finish your wreath by inserting some of the leaves as added accents. You can also check out the Copy Cat Looks blog for detailed instructions on how to create a gorgeous spring wreath made of tulips. Have you ever looked around your home and think you have too much used paper just about everywhere? Here’s great news for you: you can recycle all those paper and turn it into a wonderful wreath! If you are gifted in the art of paper folding, also known as Origami, put your skills to good use by folding up a variety of paper flowers to be placed on your wreaths. Wrap your wreath base with colored ribbon and use hot glue to secure the paper flowers in place. If you don’t know how to turn colored paper into something other than a crumpled ball, take a look at these instructions from Jen of tatertots & jello as she shows everyone how to make use of those sheets of paper by turning it into lovely Spring Paper Wreaths. During Christmas, we sometimes receive gifts with lovely wrappings and fancy ribbons, which are just too cute to throw away. Make use of these ribbons in your next wreath project. All you need are a circular base, scissors, hot glue, and your collection of ribbons. First, wrap the circular base with the thickest ribbon you have until the entire thing is covered. Next, use your imagination to strategize how you want your ribbon wreath to turn out. Apply hot glue on the area where you want your ribbons and carefully place them on that spot. Make sure everything is securely in place before hanging the finished wreath. If you want to make a wilder or fluffier wreath, using feathers is definitely a good option! There are two ways to go about this. If you want something more challenging, you can use a bag of feathers, and manually and strategically glue them onto the circular base. Next, use hot glue to securely place some small eggs around your wreath. You can check out the detailed instructions on how to make this Easter Egg & Feather Wreath on Heather Bea’s Fake it Frugal blog. 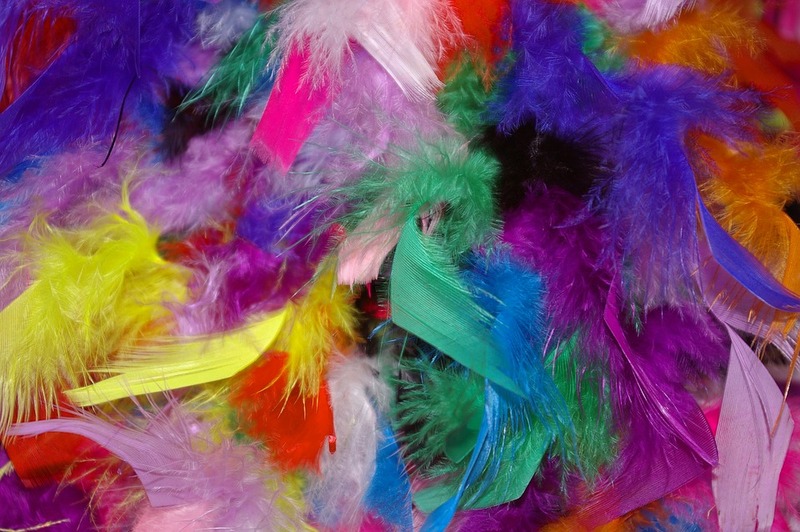 For those who want an easier time, you can use a feather boa instead of a bag of feathers. Just wrap the entire wreath base with the boa. After that, simply add bits and pieces and secure them in place using hot glue. Manuela’s A Cultivated Nest blog breaks down the steps on how to efficiently design your spring wreath using a feather boa. Don’t have time to make your own wreath but still want something that’s out of the box? Check out Treetopia’s wreaths because our wreaths are just so awesome that we’re sure there’s something that would complement your personality. Share your creative spring crafts with us!